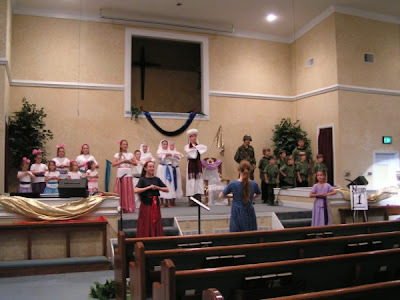 After 4 weeks of rehearsals, Fat Fat Jehoshaphat was presented last Friday at 7 p.m. and Saturday at 4 p.m. Everyone did really well, praise God! Each day there were one or two very slight stumbles on lines, but they were such that if you didn't know the play, you wouldn't have even noticed. The cast and crew were really wonderful, and so generous. On Friday night, one of the families presented me with a bouquet of white roses - my absolute favorite flower! On Saturday, they presented me with a huge card signed by most of them, and with a gift card to Walmart inside! On Saturday at the end, I made presentations of my own, giving each girl or woman involved a rose, and each character a special gift that corresponded to who they played, to help them remember the musical. They've truly been a wonderful group to work with. There still work to do, even though the musical itself is over. As I type, I'm also capturing the footage off of the video camera, so that I can make a copy of the DVD for each family that was involved. 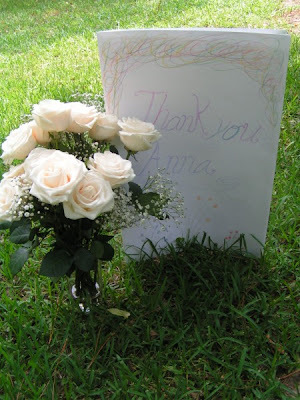 There's also thank-you notes to write, then everything to mail or give to each family. Everyone worked so hard on this musical, and each of the rehearsals were so much fun! There was a smaller amount of families that signed up then I originally planned for, but it ended up being the perfect number to work with. The 7 families that worked on it together had a wonderful time and grew to be quite closely-knit. What made it even more fun was that everyone in the family was involved, from the children ages 5-17 in the musical, to the dads that played parts or helped with lights and sound, to the mothers and young children who filled in for the parts of the townspeople of Judah, to everyone that helped behind the scenes, to my mother, who was a sounding board for each of the ideas I had. Each family also helped find and make props, or find or make different items needed for their costumes. 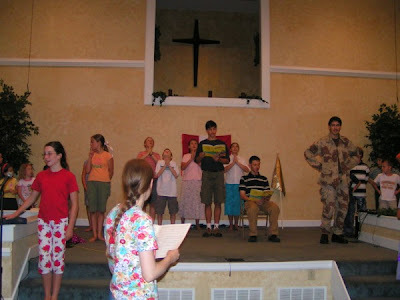 If anyone is looking for a fun children's musical to direct, I would heartily suggest Fat Fat Jehoshaphat. I grew up listening to it on a tape, thinking it was just a story. When I realized it was a musical, I knew it would be a fun one to do... someday. Kathie Hill wrote it so many years ago however, that her website no longer sells it. After the Ruth musical last year, Elijah helped convince me to order the books and accompaniment for the musical, for we'd actually found it for sale on a different website. 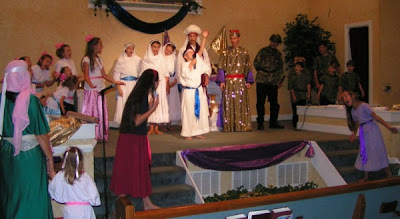 It stays true to the Biblical story, while adding very funny parts that make it fun to practice and present. Though originally geared to children around 8-12, we had people of all ages, and they all enjoyed it immensly! The audience of all ages absolutely loved it as well! 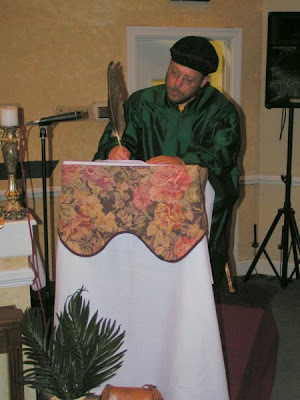 The story was about the Biblical King Jehoshaphat. Kathie Hill had a wonderful idea to make the king be Fat Jehoshaphat. Every time he'd come in, the children would sing "He's fat fat Jehoshaphat, what a good good king is he!". 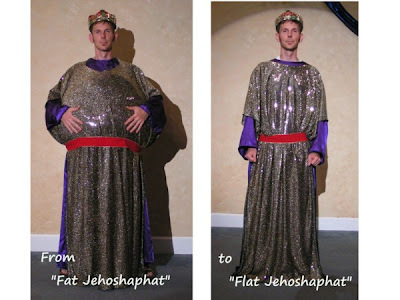 To make it even more funny, however, after the fast where everyone sought God and prayed for many days without food, Jehoshaphat turned flat from loosing so much weight!! Okay, so it's not really logical that anyone would loose that much weight in 9 days, but it sure added a funny dimension! 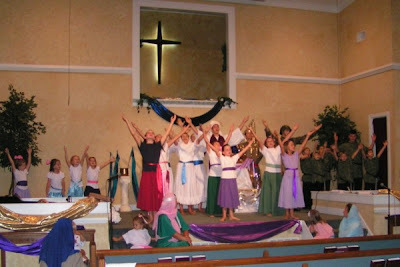 Throughout the musical are songs and lines that teach the power of prayer. The songs are very catchy, but that's okay, because they have messages that you want running through your mind at all hours of the day. From "First You Pray" to "Simple Words" to "Don't Be Afraid" to "Problems Aren't Problems When You Pray", the songs teach important lessons about how you want to pray in all circumstances and that God will indeed answer. One of my favorite lines is when King Jehoshaphat interrupts the Levites from their high-faluting prayer, intended to impress him with the big words. He says: "I may be impressed, but God certainly isn't impressed. God doesn't want us to pray with our minds, but from our hearts. He doesn't care how smart you are, just how sincere you are." The children learned quickly by listening to the practice CD, and I know they've learned a lot, even just by subconsciously listening to and singing the songs. We prayed that this musical would be done for God's glory, and from the feedback we've gotten, it did indeed bless many people. It's wonderful and humbling how something we worked on can reach others in their point of need and remind them of God's faithfulness. This was my 4th and last musical to present as a pre-college teen, and it was perfect to end with. Though I will miss everyone so much when I go to college, I have the hope that I'll be able to continue directing musicals in the summers, and, if the Lord wills, even more after I graduate. The pictures included are just a fraction of those that I would have liked to share! If you'd like to see more pictures, click here to see pictures from the rehearsals and dress rehearsals, telling a little more about the musical and including quotes from it, and here to see cast pictures. Each of the characters were so well played! I am glad the play turned out great! It sounds like it was a lot of fun! I enjoyed looking at the pictures on here. I was praying for you! It looks like everything went well, and all for God's glory, which is the most important thing! I love the roses, by the way! Mardi: Indeed, it was a lot of fun! Glad you enjoyed the pictures! Ella: Thank you so much for your prayers! I can't say enough how much I enjoyed this play. It was perfectly cast and absolutely hilarious in all the right places. Yet the message was so clearly communicated that even a child could grasp it. FIRST we pray, then we wait (until we hear from the Lord), then we obey! I was in this musical when I was a kid! It was so fun! I did a google search trying to find a place to buy the cd. Do you know where I could get one? Mrs. Katie: That's neat that you were in the musical as a child! As far as I know, they don't sell a CD of the musical. We bought the tape (available here: http://www.jjonline.com/catalog/productPage.php?productID=4848 ) and then made the tape into a CD using the computer, since it would be really hard to work with a tape in a musical. I'm so glad to see your pictures of this play! I'm trying to find accompaniment for it to do with my school. Looks like it is out of print. Any ideas?